Teamsters Local 743:	Corrupt Officials Scatter, Workers Say, "Not Wanted" | Fight Back! Corrupt Officials Scatter, Workers Say, "Not Wanted"
Chicago, IL - The union officials at Teamster Local 743 in Chicago never fight the bosses. They never strike, and tell members that striking is bad. The result is poor contracts, smaller and smaller raises, non-union workers doing union jobs, and once good benefits disappearing. The nearly 14,000 members of Local 743, who are health, industrial, office, and warehouse workers have had enough. The New Leadership Slate is running candidates in the upcoming election to take over Local 743. It's a rank and file slate committed to ending the graft of the old-guard, hiring more union representatives, mobilizing the members, and cutting union officials' huge salaries and perks. The 743 New Leadership Slate includes workers from the University of Chicago Hospitals who are sick of rigged contract ratification votes, and workers who lost their health insurance because allies of International President Hoffa, Bob Walston and Richard Lopez mismanaged the fund. "We're in contract negotiations at Rush-St. Lukes right now. The pro-Hoffa union representative Reggie Ford gives no leadership to these negotiations. If it wasn't for the 743 New Leadership Slate mobilizing the members, he [Ford] would have given away the entire store," said Debra Simmons, candidate for Secretary Treasurer on the New Leadership Slate. Instead of protecting rank and file fighters, the Hoffa people work with the bosses to get them fired. "Our company was sold this summer, and the new owners fired people with over 10 years experience," said Edwin Soto an employee at Flextek, one of the fired workers. "They fired those of us that fought the bosses when our contract was violated. 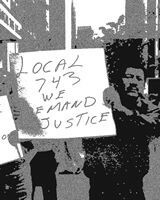 When we pushed the union to get our jobs back, the President of Local 743, Bob Walston, threatened the workers rather than fight in their interests." Soto is a candidate for Trustee on New Leadership Slate. Richard Berg, a candidate for President of New Leadership Slate said, "The workers of this union are united against the corruption, and they are poised to fight the bosses by taking this local back to the members. Our members demand dignity and respect, and won't stop until these thieves and fools are kicked out the union." In Teamster locals all over the Chicago area, bad contracts being negotiated. "There are too many Latino workers being treated badly," said Mercy Soto, a night unloader at UPS in Local 705. "I have campaigned at workplaces in Local 743 where there are two-tiered contracts. Latino workers get hired at lower rates than what the contract says. If people speak out, they get fired, and the union doesn't fight for them. People are tired of being threatened by the bosses and union officials that tell them to stay in their place or La Migra (the Immigration service) will come for you. We have to see some serious change here in Chicago." The New Leadership Slate sees itself as a part of the broader movement of workers. At the 2001 Teamsters convention, New Leadership Slate delegates took stands against the Hoffa old-guard. "We fought for raising the strike benefits for all striking workers, cutting and capping salaries and perks for top officials, and took stands against racism in the Teamsters," said Tony Caldera, another New Leadership Slate candidate for Vice President. At the convention, Tom Leedham was nominated for president on the Rank and File Power Slate. The Hoffa forces attempted to shut down the reformers, but failed. The Rank and File Power Slate fought Hoffa and his kissing up to President Bush. Reformers were also able to force the Teamsters to take a stand against the U.S. Navy bombing on the Puerto Rican island of Vieques. Hoffa has since built his love nest with Bush by supporting his bid to drill in the Arctic National Wildlife Refuge. The whole of the Teamsters Union is in motion. With national elections coming up soon, the life or death issues have pushed many in the union to reflect upon the need for change from the top to the bottom. William Jenkins, a worker at Rush-St. Lukes said, "The New Leadership Slate is grounded in the working class. That's why we support Tom Leedham. That is why we are committed to turning around the labor movement, not just in Teamsters 743, but around the country." 743 New Leadership Slate member Christine Royster was nominated for Vice-President on the Tom Leedham Rank and File Power Slate. If elected, she will be the first African American woman ever to serve on the Teamster International Executive Board. "I am honored to be running for this office," said Royster, "Too many Black and Latino workers are ignored and treated like second-class union members in the Teamsters. The Tom Leedham Rank and File Power Slate is going to change all that."